Donald Trump’s campaign on Sept. 1 said that news of a secret deal that allowed Iran to evade restrictions on its nuclear program shows just how “deeply flawed” the nuclear agreement pushed by President Barack Obama is. Reuters on Sept. 1 cited a soon-to-be-published report by the Institute for Science and International Security which said the U.S. and fellow negotiating partners secretly agreed to allow Iran to bypass limits on its stockpile of uranium. The report cites government officials who participated in the negotiation process prior to the signing of the deal last July. 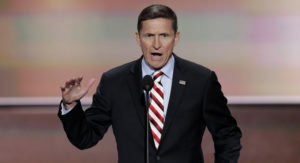 “The deeply flawed nuclear deal Hillary Clinton secretly spearheaded with Iran looks worse and worse by the day,” retired Lt. Gen. Michael Flynn, a Trump adviser, said. The new report shows Obama “gave away the store” when the agreement was sealed last year, Flynn said. Trump, who has labeled the deal with Iran as “disastrous,” has vowed to block the nuclear deal and to prevent Iran from acquiring an atomic weapon if he is elected in November.